Don't discount artists, philosophers and poets. One day you might need them to teach you how to live. I learned something important last weekend. You don’t need to die to go to heaven. I took a wine bottling class. 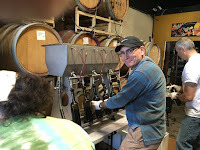 I was surrounded by wine, helping to move it from barrel to a vat, and finally to the bottle, as well as putting on foil, and boxing them for shipment (and doing quality control of the juice). It’s the Zen realization that you are already in heaven, every day. It’s everything, meetings, writing, planning, having dinner, photography, and yes, bottling wine (and juice quality control).